This article was right up my earthy alley. 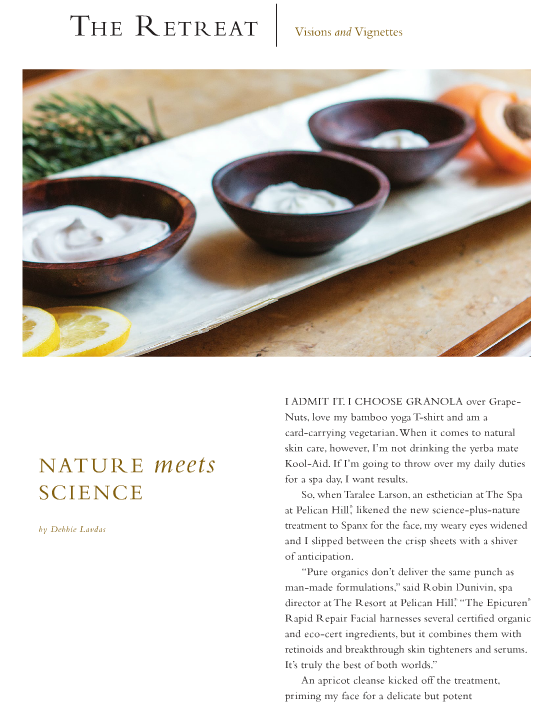 Fall 2015 Spa story for Pelican Hill Magazine (I’ve had the great pleasure of writing the Retreat feature for the past several years). “I admit it. I choose granola over Grape-Nuts, love my bamboo yoga T-shirt and am a card-carrying vegetarian. When it comes to natural skin care, however, I’m not drinking the yerba mate Kool-Aid. If I’m going to throw over my daily duties for a spa day, I want results.